Making easy, round toothed gears. As the first part of my college graduation project, I assembled a simple robotic arm (Shown on the photos on the right. Find out more about it here.) that required the fabrication of a robotic gripper. Since I didn't have any previous experience in the subject, on-line open design resources had to be used. I ended up using Jjshortcut's Robotic arm with 7 servos (licensed under the Attribution - Non-Commercial - Creative Commons license) design, as it seemed sturdy and fairly easy to comprehend. But to come up with my own derivative project, some tinkering with the original design had to take place and among all the modifications, gears proved to be the most a challenging to implement. 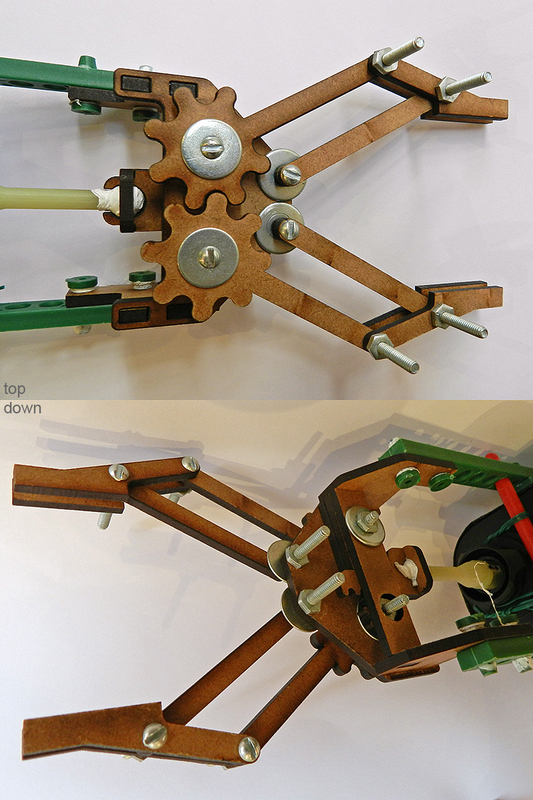 In order to learn more about the subject, some on-line research was done and I have discovered why Jjshortcut used them in his design: rounded toothed gears are a lot easier to design than its angled counterparts and they also providing a reliable enough circular movement transmission method, with more than enough precision for educational and experimental projects. 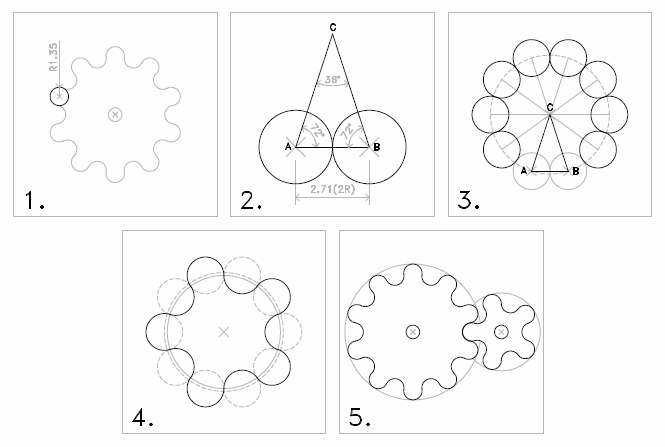 Rick Harris' document on How to make gears easily was a very important starting reference to help me understand how to create such objects. At the same time, I felt his method had a few loose ends as the author's draws some of his conclusions from visual estimates. Therefore, I've decided to make my own gear tutorial, expanding the acquired knowledge with my own findings. Please feel free to use this document in any way you like, but if you do, please give me credit by providing a link to this address from your work. 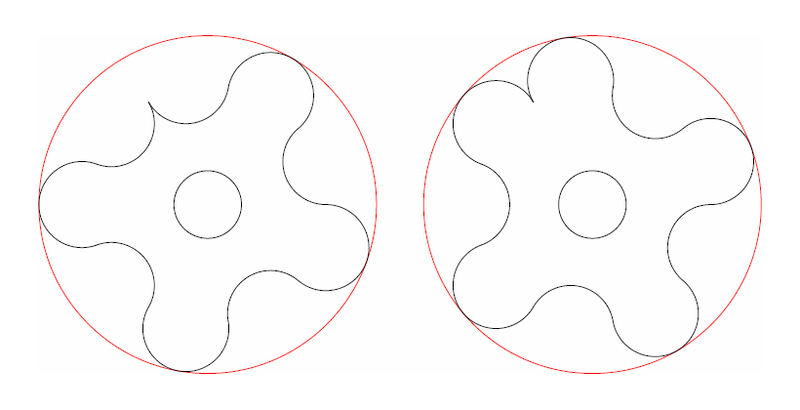 The image on the left is a random example of a round toothed gear, just like the one I'll teach you how to make. The circles marked in red and their radii Rt (Radius of a Tooth) and Rg (Radius of the Gear), are the basic units of this type of gear - or better put, these radiuses, together with the number of teeth are the parameters that you'll use alternately as constraints to generate a gear. Also, if you pay attention to the grey dashed circles (let's call them Constructive Circles, or CCs). Notice two important things about them: they interspersedly form the teeth and slots of the gear and, for that reason, they should always be used in teeth/slot pairs. Those are important aspects to notice because in every gear you plan, you must use an even number of CCs. If you don't, you'll be leaving one of your teeth/slot pairs incomplete (See an example). So, even if you need an odd number of teeth, you'll use an even number of constructive circles that is twice as big as the number of teeth you need, because you're accounting for teeth/slot pairs, not just teeth. You'll also be using any CAD software in order to obtain a highly precise result without having to deal with any complicated manual calculations (if you need to know the mathematics behind it, for some reason, let me know). My CAD of choice is Draft Sight, because it's extremely similar to AutoCAD but, unlike the Autodesk product, you can use the software for free, by getting a free individual, non-commercial license. Gear size constrained by the space it must fit in. Or, Calculating Rt and number of CCs from a given Rg. 1. 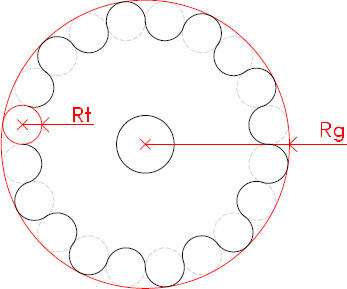 Start by determining a Rg circle that fits the available space. 2. 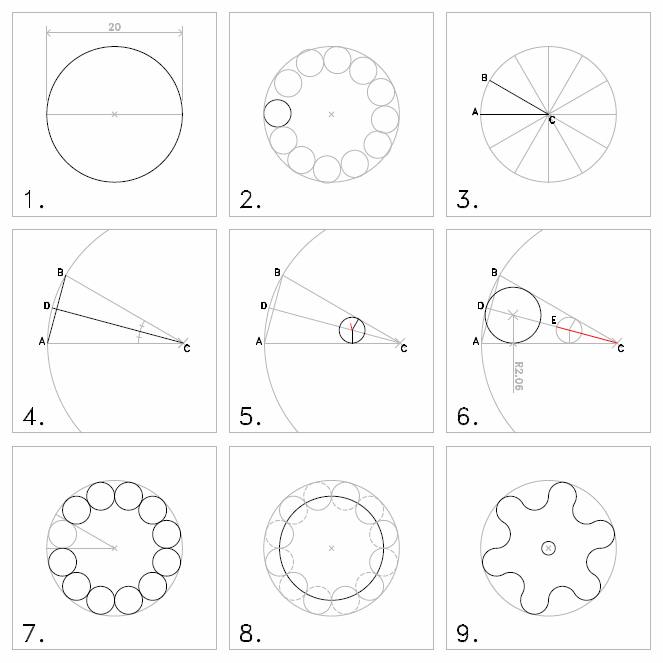 Visually determine what you believe would be a good teeth size, by placing a Rt circle (shown in black). Don't worry about precision, as this is just a draft and will be deleted in a minute. Arrange (also visually) copies of the circle you created following the perimeter of the bigger Rg circle. Count how many Rt circles there are (In this case, 12). Important: If there is an odd number of circles add +1 to your count! Like explained earlier, this number must always be even. 3. Turn on the entity snap (type 'esnap' on DraftSight. Make sure the perpendicular option is checked.) 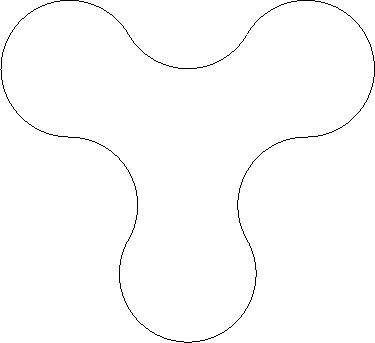 and create a horizontal line linking the center of your Rg circle (point C) to its leftmost point A. 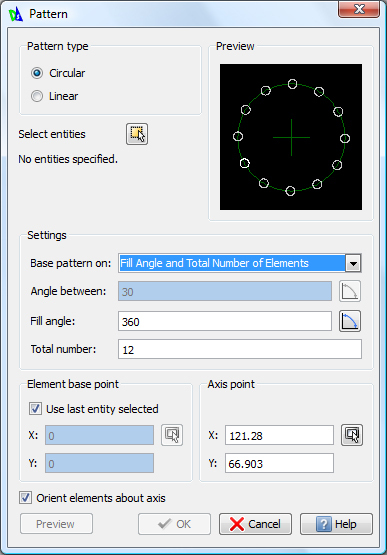 Using the array command on your CAD (type 'ar', on DraftSight and AutoCAD), and configure it to distribute 12 similar objects using the center of the circle as axis point (example). Alternativelly you can make a copy (type 'co' on DraftSight or AutoCAD) of line AC and then rotate it α degrees from point C (type 'ro' on DraftSight or AutoCAD), where α is -360º divided by number of circles distributed (in our case, 12). Next you'll work with the formed ABC triangle. 4. If you used the array technique, delete all lines except those forming the ABC triangle. 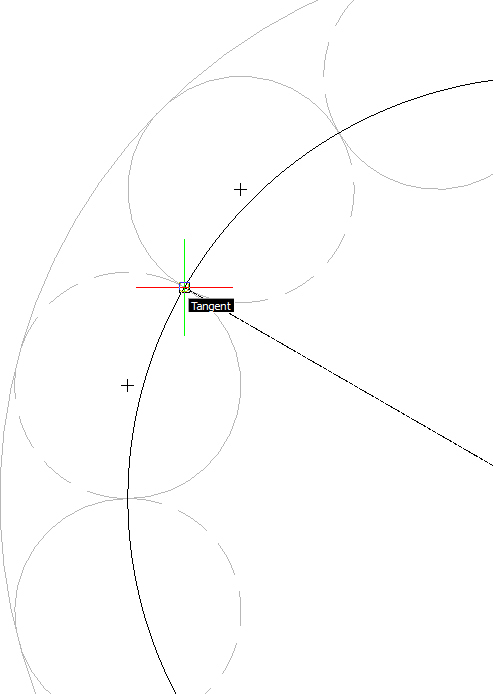 Now, using end point snapping, draw 2 new lines: one linking points A and B; the other coming from C, perpendicular to the midpoint of AB, extending it (type 'ex' on DraftSight or AutoCAD) until it touches point D, on the Rg circle wall. 5. Start a line anywhere in you drawing in the direction of line CD (drawn in red) until the perpendicular icon appears. Then create another line snapping perpendicularly from the point formed by the red line and CD and either AC or BC. Important: Be careful not to snap in the middle or end points of the lines! The line you have just created is in fact the radius for a circle to which lines BC an AC are tangents. 6. Now we need to scale the circle in order to put it in its final CC role. Using line CE as a reference, use the scale command (type 'sc' on DraftSight or AutoCAD. Select 'reference' option), then drag what until point E touches point D.
7. We now have built our first CC and need to replicate it in order to fill the other positions around the Rg circle by using the array command (example), selecting C as the axis point and the CC as entity. 8. Create a new circle - also centered in C - that intersects all CCs in the exact point where they touch. Then, using the trim command (type 'tr' on DraftSight or AutoCAD) interspersedly delete tops and bottoms of CCs (represented by the dashed lines in the image), to form teeth and slots of the gear. 9. Your gear is ready! Don't forget to draw the opening in the middle, where your axle will fit. Rt dictated by another gear. Or, calculating Rg and number of CC from a given Rt. When you are creating a gear for an existing transmission system, you must first measure (or know in advance) the Rt of the existing gear you'll have to interact with. Then, from that value, you'll need to figure out the number of CCs that the new gear will need: A. If the space on the system you're designing is restricted or if you need to transform frequency of rotation into torque you might want to start with the smallest values of number of CCs (The smallest value being 4. Maybe 3 would work too, but I've never tested it. ); B. If what you need, is to transform torque into frequency of rotation, create a gear that has a greater number of CCs than the existing one; C. If you have none of the mentioned restrictions bothering you or if you need to maintain the torque, just create a clone of the original gear. 1. The Rt value of the existing gear will be used as starting point to create the new one. 2. The first two CCs are created, centered on points A and B. The AB line links both centers and its length is the diameter of one of the CCs. Now it's the time to determine how many teeth the new gear will have, considering the reasons mentioned earlier. For this example, we'll be working with five pairs of teeth and slots. The next step is to divide 360º by the number of pairs used, in order do discover the value of the angle formed in C by lines AC and BC, an consequently the values of the angles in the base of the isosceles triangle ABC. Construct the triangle by creating a line parallel to line AB, then rotating it (type 'ro' on DraftSight or AutoCAD, then the value of the angle). 3. Using the array command (type 'ar', on DraftSight and AutoCAD), select both CCs created earlier as the entities to be copied, then type the number of teeth/slot pairs you'll need (5 in our case), selecting point C as the axis point. 4. Create a new circle - also centered in C and represented in solid grey line in the image - that intersects all CCs in the exact point where they touch. Then, using the trim command (type 'tr' on DraftSight or AutoCAD) interspersedly delete tops and bottoms of CCs (represented by the dashed lines in the image), to form teeth and slots of the gear. The oultines of the new gear can already be seen represented in black. 5. Your gear is ready! See how both gears fit perfectly. Also, don't forget to draw the opening in the middle, where your axle will fit.